the Best Nights Sleep without Drugs! to rebuild and rejuvenate themselves. nutrition to rebuild and rejuvenate themselves. 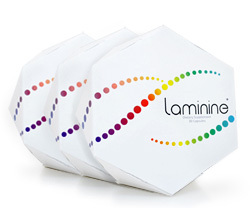 Laminine® is a unique and patented formula that provides essential proteins and amino acids. These amino acids contain the proper transport mechanisms that direct these nutritional building blocks to where our body needs it most. This natural, synergistic superfood contains most known vitamins, important trace minerals and eight essential amino acids sourced from land, sea and plant. Laminine® unleashes a powerful repair mechanism inside all of us. It can bring physical, mental and emotional health to a new level. Laminine® has a variety of potential health benefits, including strength, stamina, focus, improved sleep, increased libido, and sense of wellbeing. These various effects may all be related to the significant reduction of the stress hormone cortisol following the ingestion of Laminine. Dr. Eskeland hypothesized that partially incubated, fertilized hen eggs contained a unique combination of amino acids, peptides, and protein fractions that could help provide an incredible array of health benefits upon consumption. It was found that on the ninth day of fertilization these partially incubated, fertilized eggs theoretically contain all the nutrients required to start a new life. This includes vitamins, minerals and proteins, as well as important defense factors, growth factors and hormones. Its source is from the "Miracle of Life"